In my years of counseling victims of domestic violence, I have met some pretty angry people, and in many cases, their stories have angered me as well. Domestic violence can be unimaginably cruel, and it is difficult to hear the accounts without feeling upset about the injustice of it all. Quite often, victims are not only injured by their spouses, but they find very little support when they reach out for help. Our desire is certainly to be part of a real solution and not to worsen the problem. We hope that women facing such a situation at SGC would feel loved and cherished and supported. If this represents you, please know that the pastors are ready to help in any way we can. You can contact me ([email protected]) or the office or one of the other elders directly. One common assumption is that abuse is extremely rare and probably far less common in the church than outside of it. The research, however, paints a different picture. Chris Moles has written on the subject and said that as many as ¼ of Christian wives are victims of domestic violence. Exact data is not easy to gather, but it does tell us there are more couples facing this dynamic in their relationship than we would like to admit. Abusing a spouse is sin. Abuse by a man toward his wife is not an expression of biblical male headship but a gross distortion of it. It is not a sign of strength but the expression of a sinful heart. It is not someone being “emotional” but someone losing all self-control. Such a man does not need our sympathy but our rebuke (at least). God’s Word is clear on this. You can see this positively by looking at what God requires of the husband. An example is what Paul says on male headship in Ephesians 5: “The husband is the head of the wife even as Christ is the head of the church” (5:23). Husbands, love your wives, as Christ loved the church and gave himself up for her, that he might sanctify her, having cleansed her by the washing of water with the word, so that he might present the church to himself in splendor, without spot or wrinkle or any such thing, that she might be holy and without blemish (Eph 5:25–27). The command to “love” is far more than an occasional feeling of affection. It is a way of treating someone that is headed in a specific direction. Jesus gives us the shape of that love. Notice the two purpose statements connected to his self-giving. He loves so that “he might sanctify her” and so that “she might be holy.” A husband’s love toward his wife isn’t just to satisfy his own desires but to make his wife more holy. The husband’s love is a self-giving that leads to her holiness. Many abusive men, particularly those who claim to be Christians, view marriage as a hierarchy of power in which the husband’s authority is used to press down upon the wife in such a way that he not only oversees her behavior but controls her actions. “Oppression” and “violence” are two ways the Bible speaks to the issue. “Oppression” is the exploiting of the weak by the strong, taking advantage of someone who very often is not in a position to fight back. Sometimes the entrapment is because of fear of retaliation, sometimes it’s a false feeling of being trapped, sometimes it’s because of a sense that children will be negatively impacted. “Violence” is when the sinful anger of a heart overflows all boundaries and becomes a physical or psychological intimidation. When a husband corrupts headship so that it becomes oppression, he is not acting with biblical authority but rejecting God’s authority. A key verse on headship here is 1 Cor 11:3: “The head of every man is Christ, the head of a wife is her husband, and the head of Christ is God.” Male headship is not the only headship. A male is to see that he himself has a head, “Christ.” The husband is the head of a home and not the tyrant of a home, because he himself has a head above him who is all-powerful, all-knowing, impeccably holy, and the one “who is to judge the living and the dead” (2 Tim 4:1). And, of course, this works in the other direction as well. A wife who reviles her husband—“revile” is verbal abuse; 1 Cor 5:11—and preys on a weakness in the man that hinders him from showing the backbone he should, has strayed far from God’s call on her as a wife. Her need to display “the imperishable beauty of a gentle and quiet spirit” is nowhere visible in such an environment (1 Peter 3:4). Domestic violence is a pattern of many behaviors directed at achieving and maintaining power and control over an intimate partner, such as physical violence, emotional abuse, isolation of the victim, economic abuse, intimidation, and coercion and threats. Psychological aggression includes expressive aggression (such as name calling, insulting or humiliating an intimate partner) and coercive control, which includes behaviors that are intended to monitor and control or threaten an intimate partner. When Joy Forrest spoke to a group of us at SGC last summer, one of her key observations was that a person can experience intensive psychological distress and even damage long before someone raises a hand or a clenched fist. 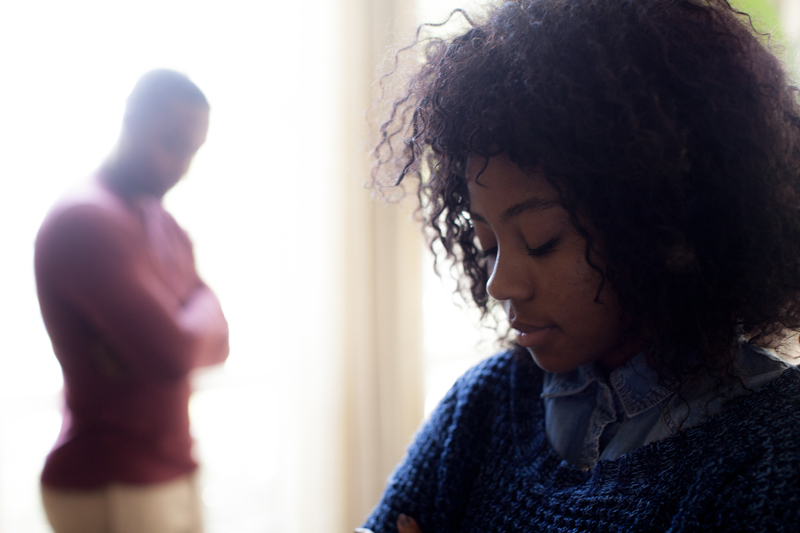 When a spouse has successfully created an environment of fear and intimidation, sometimes it only takes a look. While most physical abuse will involve men toward women, such non-physical types of intimidation and aggression can also be from women toward men. We all know couples who give each other a hard time. But it can escalate to an oppressive situation when it becomes deeply humiliating and manipulative. Long-term intimidating or manipulation—even when there’s no violence involved—can bring such distress and confusion that the one oppressed can really think he or she is going crazy. Such an oppressive relationship is soul-crushing, emotionally exhausting, traumatic, confusing, and can even lead to mental illness when it’s prolonged. The one who is oppressed can sometimes lose touch with reality. They can’t tell what’s normal anymore. And of course one of the great tragedies of someone within a relationship like this is that often no one else knows. There are countless stories of couples “struggling” who see a counselor or pastor and the conflict gets treated as if it’s within the normal realm of marital conflict—each person contributing something to the problem, each person needing to confess something, etc. It is not easy to speak on such issues, for these topics represent some of the darkest parts of life in a fallen world. Wrestling with the agony that victims of oppression and violence have experienced and are experiencing surely tests us, just as we are challenged by the justice and confrontation required to minister to the oppressors and the violent. But hard as it is, may we grow as a church and as individual Christians so that we can act with wisdom, compassion, and courage as each of these are needed.